I've lost all sense of the days. So when I saw an email reminder for the February Recipe Swap happening today I nearly fell out of bed. I was sure I had another week to play in the kitchen. Nope, turns out I had about 5 hours. ACK! This swap was to remake a wild rice salad. I sat stunned for a moment holding my coffee cup exactly 1 inch a way from my lips. The intoxicating smell snapped me out of my trance. There is always wild rice in my pantry thanks to my Minnesota connections. Hundred of wild rice salad variations have made their way through my kitchen...but I was feeling this recipe needed to be more just a salad. Savory pancakes came to mind as a wave of long forgotten creativity waved over me; then a moment of remembrance brought the whole dish home. Just a few weeks ago we were battling to reel in beautiful Dorado (Mahi Mahi) while deep sea fishing in Cabo San Lucas. We grilled our catch for our group as a celebratory dinner on our last night; luckily we had one of the largest catches smoked to bring home with us. This smoked Mahi Mahi is a perfect accompaniment to the wild rice. Years ago I started a section on this blog called 'Strange Ingredients' where viewers (friends) would send me an odd ingredient and I would make something from. it. So what does that have to do with this late breaking recipe? It is due to two strange ingredients which are in my possession that I was able to pull this off. White wheat flour from Fargo (thanks Jenny and Marty!) and raspberry chipotle dressing (thanks Karen!). I can't stress enough how fast and easy this dish comes together. Outstanding as an appetizer, but it's a must serve for brunch. Another successful Fat and Happy recipe swap.... just in the nick of time! Fat and Happy Food Blog Tips and Techniques: Use mostly the green tops on the onions, reserve the stronger white area for another use. Trader Joes has a decent smoked trout at a great price that could be substituted for the smoked mahi mahi. Raspberry chipotle dressing should be available at your local grocery store. Place the eggs in a large mixing bowl, use a fork to mix the eggs well until light and fluffy. Add in the half & half, cooked wild rice, green onions, flour, sugar, salt and pepper, stir to combine. Pour in 2 tbls of melted butter, stir to combine then let the mixture rest for 10 to 20 minutes. While the pancake mixture is resting, mix the yogurt with the dill; set aside. Slice or shred the smoked fish. Heat a skillet over medium-high heat and grease the pan with the remaining butter. Drop spoonfuls of the pancake mixture into the hot pan; about 1-2 tablespoons of batter per pancake is plenty. Use the back of the spoon to lightly smooth out the batter so that the rice isn't in a pile in the middle. Cook until browned on one side then flip over. Brown on the second side. 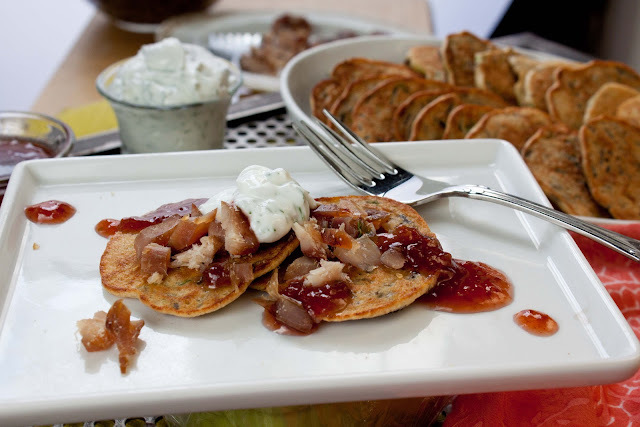 To Serve: Place one or two wild rice cakes on a plate, add a few pieces of smoked fish, drizzle with the raspberry chipotle dressing top with a dollop of the dill yogurt. Enjoy! I would eat pancakes every meal of the day if I could so I love seeing different pancake recipes. Smoked mahi mahi sounds ahhhhmazing! There's nothing quite like eating something you caught yourself. The raspberry chipotle dressings sounds incredible too! Way to pull off an extremely impressive dish on such short notice! Love those wild rice pancakes! They would be a great brunch item. So classy with the smoked fish and the wild rice! For only having 5 hours to come up with something, you did a REAL good job! These look fantastic! I'm loving the combo of green onion dill and raspberry chipotle dressing, YUM! Oh my goodness!!! My first recipe with wild rice was a dill-snap pea-mustard dressing-smoked fish affair, which was so delicious, I ate it before I could photograph it. I love the flavor of smoked fish on just about anything, so this one goes into my virtual recipe box. Thanks for sharing! I love this recipe. I am just going to pick up some mahi mahi for a Hawaiian dish I want to try. These rice pancakes are a stellar addition to the swap. It would never occur to me to put rice in pancakes. Genius idea! 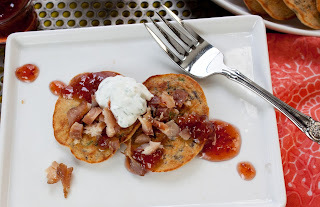 I love the idea of savory pancakes! These look crispy and delicious! I love savory pancakes! and mahi mahi! great recipe!